International ferry service between Bar Harbor and Yarmouth, Nova Scotia, was discontinued years ago, but on July 12, 2018, the Boston Globe reported that a proposal may be forthcoming to re-start the service. 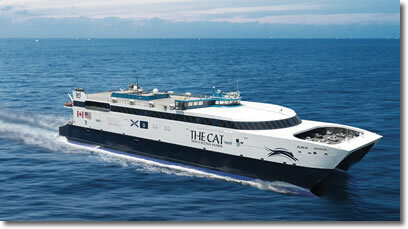 There is currently international ferry service between Portland ME and Yarmouth, Nova Scotia on The Cat, a fast ocean-going catamaran car-and-passenger ferry. 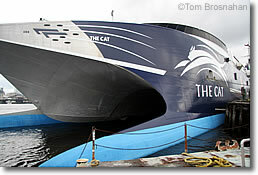 The CAT, the luxury catamaran ferryboat now zooms between Portland ME and Yarmouth, Nova Scotia, and may again depart from Bar Harbor in the future.